The first time Peter Cheney stepped inside a float tank, his life changed. For nearly 20 years, Cheney, who grew up in Wall Township, was living in Colorado, working in and out of the bustling restaurant scene as a manager. “I was literally sitting in the tank one day and said, ‘You know what? Maybe if I bought a bunch of float tanks I wouldn’t have to work in a restaurant anymore,’ ” Cheney said. In November of last year, Cheney returned home to the Jersey Shore and opened The Float Studio, 3209 Sunset Ave. in Ocean, where guests can relax, recover, reset and renew. Flotation therapy has become a recent phenomenon that offers physical and mental benefits. 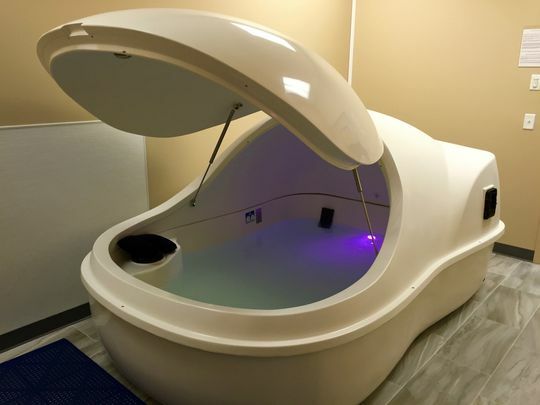 During a session, clients will float inside a “pod” that is filled with 900 pounds of Epsom salt dissolved into 10 inches of water that removes the effects of gravity on the body. The salt-water solution is heated to skin temperature, leaving every muscle in your body feeling fully relaxed. “There’s kind of something for everybody — most of all just relaxation and de-stressing, but people with chronic pain, with back issues just love the float. 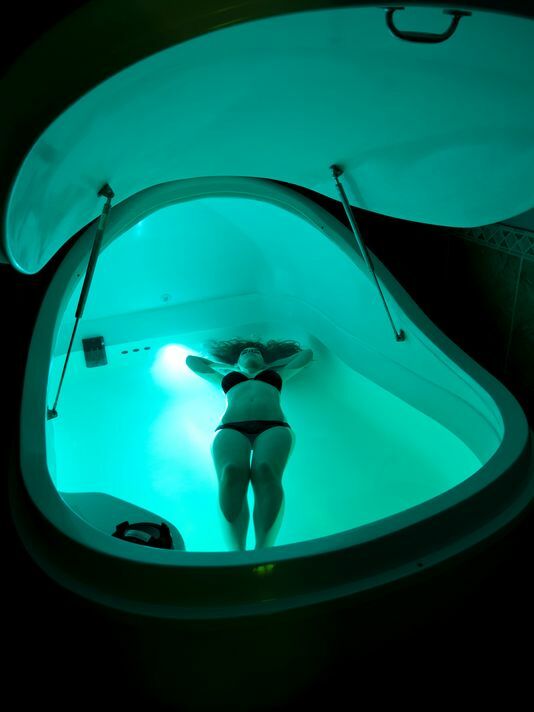 Floating gives you a break from gravity … it can decompress your spine,” Cheney said. Cheney said athletes often visit The Float Studio — the Epsom salt is beneficial for muscles and joints pre- and post-workout. He said triathletes and marathon runners come in regularly during their training so that their muscles can relax and recover faster. Floating offers a variety of mind and body benefits. The magnesium from the high saline solution helps improve sleep patterns, Cheney said and the sensation of feeling weightless evokes a sense of well-being. Cheney said everyone loves their first float, but the experience constantly improves with each visit — it’s a practice, like yoga, he added. For Felix Papadakis of Allenhurst, floating has been a process — the first time he went into the pod, he felt antsy. It wasn’t until his second visit, that he was able to calm his wandering mind. “About an hour in, your mind just enters that truly transcendental place where you’re just filled with beautiful thoughts,” Papadakis said. “I guess I’ve meditated in the past, but it was nothing like that. I’ve never reached that place. Floating can relieve depression and anxiety, improve blood circulation, reduce blood pressure, heart rate, relieve pain and more. Since opening up at the Shore last year, Cheney has added a third float pod to keep up with his growing number of clients. He’s considering adding a fourth. Each pod is located inside its own private room that comes complete with a shower, which clients use before and after floating. COST: $65 for a 90-minute float. There is an introduction to floating special that includes three floats for $120. Monthly memberships are also available: eight floats for $320, four floats for $180 and two floats for $110.